The Shadow story is now a children’s picture book! 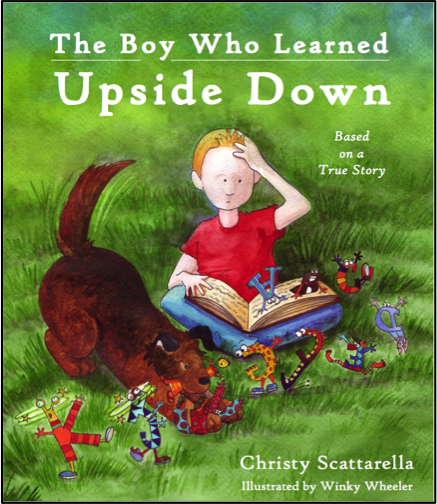 The Shadow Story is now a children’s picture book: The Boy Who Learned Upside Down, written by our very own founder and Executive Director Christy Scattarella. Alex is a kid with learning disabilities who’s miserable at school. When he tries to read a book, the letters sprout arms, legs, skateboards – even stilettos – and escape off the page. “I give up!” he says. “Why can’t I just be like everyone else?” Then something amazing happens. His teacher challenges Alex to become a courageous student – something that seems impossible for a kid like him. With the help of his dog Shadow, Alex sets off on one adventure after another in pursuit of his goal. 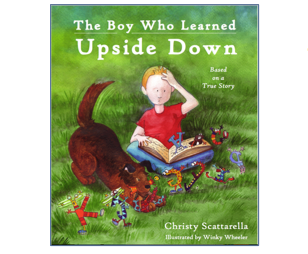 Along the way, he learns to help others, to believe in himself and to turn “I can’t” into “I CAN!” Ultimately he discovers that his greatest shame – being different – isn’t so bad after all. And that gives him one big, super-duper different idea – to help other kids like him. The Shadow Project named for Alex’s dog, teams with special education teachers to help children succeed in school. Today, The Shadow Project serves 1,500 students in 33 Portland-area schools. Alex is a college graduate who continues to volunteer for the program. The Boy Who Learned Upside Down promotes a greater understanding of children living with disabilities such as dyslexia and ADHD. Packed with humor, adventure (and a really cool dog!) the book offers children a book that they can identify that encourages them to discover their own hidden strengths. Proceeds benefit The Shadow Project. Available at Powell’s Bookstore, online at Powells.com and Amazon.com and other online and retail booksellers. Stay tuned for news about book events and more!